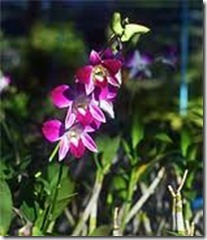 What Is the Origin of Dendrobium Orchids? The Dendrobium genus of orchid (Orchidaceae) is a tropical flower that contains over 1,200 species. Dendrobiums have cane-like stems with racemose (clustered) flowers. According to University of Hawaii researchers, they are growing in popularity for decorative use due to their range of colors, sizes and shapes, year-round availability, and long flowering life of several weeks to months. Dendrobiums are originally from southeast Asia. Their natural habitat stretches from northern India to islands off the east coast of New Guinea and Australia to Polynesia, bordered by the Tropics of Cancer and Capricorn. The climate in their native habitat is always hot and moist at sea level with little variation. They also dwell in the colder climates of the higher latitude regions. A Swedish botanist named Olaf Swartz (1760-1818) published a series of articles which were probably the first devoted exclusively to orchids in 1800. The Dendrobium was one of the 25 genera he detailed in the work. 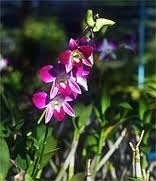 Dendrobium seeds develop in a pod and require 3 to 5 years and a sterile environment to germinate and bloom properly. All the species of this genus grow on trees, and occasionally, on rocks. They are mostly categorized as epiphytic air plants, but some are lithophytic, growing on rocks or stony soil.